They therefore brought him out, to do with him according to their law; and, first, they scourged him, then they buffeted him, then they lanced his flesh with knives; after that, they stoned him with stones, then pricked him with their swords; and, last of all, they burned him to ashes at the stake. Thus came Faithful to his end. Now I saw that there stood behind the multitude a chariot and a couple of horses, waiting for Faithful, who (so soon as his adversaries had despatched him) was taken up into it, and straightway was carried up through the clouds, with sound of trumpet, the nearest way to the Celestial Gate. When they are dead, you’ll live from age to age. For though they kill’d you, you are yet alive! Earlier in the allegory Evangelist had foretold that one of the pilgrims would be martyred in the town of Vanity. Now, at the trial’s end, Faithful is cruelly put to death. Bunyan describes Faithful’s death in a manner familiar to his readers. 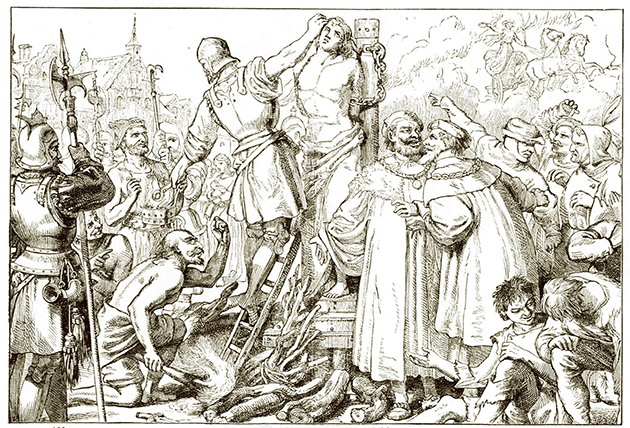 Foxe’s Book of Martyrs was first published in 1563 and was widely known; Bunyan had a copy of the book, along with his Bible, in his prison cell. Bunyan begins with a physical description of Faithful’s martyrdom. His words point us to Scripture. Hebrews 11 speaks of many who “died in faith, not having received the promises, but having seen them afar off were assured of them, embraced them and confessed that they were strangers and pilgrims on the earth” (verse 13). “… Others were tortured, not accepting deliverance, that they might obtain a better resurrection. Still others had trial of mockings and scourgings, yes, and of chains and imprisonment. They were stoned, they were sawn in two, were tempted, were slain with the sword. They wandered about in sheepskins and goatskins, being destitute, afflicted, tormented—of whom the world was not worthy…” (Hebrews 11:35–38). Bunyan also alludes to Jesus’ death. Jesus was scourged before he was delivered to be crucified (Matthew 27:26). Pilate delivered Jesus to the Jews to be judged according to their law. Then Pilate said to them, “You take Him and judge Him according to your law” (John 18:31. The Jews answered him, “We have a law, and according to our law He ought to die, because He made Himself the Son of God” (John 19:7). “Then it happened, as they continued on and talked, that suddenly a chariot of fire appeared with horses of fire, and separated the two of them; and Elijah went up by a whirlwind into heaven” (2 Kings 2:11). Faithful is lovingly ushered to the very gates of the Celestial City while Christian remains behind to eventually press on in the Way. 1. God regards the death of His saints as precious. God cares for us in life and He will care for us in death. Even if our death comes in way that seems sudden, unexpected, tragic, painful, unjust or cruel, we can trust that God will enfold us in His love and safely bring us home. 2. For the saints of God, death is gain. Paul concluded: “For to me, to live is Christ, and to die is gain” (Philippians 1:21). He said that while he saw the need to labor for the gospel, he had “a desire to depart and be with Christ, which is far better” (Philippians 1:23). Departing is to “be with Christ.” Paul reasoned that to be “at home in the body” is to be “absent from the Lord,” but to be “absent from the body” is “to be present with the Lord” (2 Corinthians 5:6–8). This is what Jesus promised to the repentant thief on the cross: “Today you will be with Me in Paradise” (Luke 23:43). It is this promise that emboldened Evangelist to tell the pilgrims that the one who would die at Vanity Fair would “have the better of his fellow.” Though Faithful died painfully and soonest, he escaped the ongoing toil and dangers of the journey and was soonest to enjoy the immediate presence of Christ. 3. God is sovereign over life and death. God has sovereignly determined the number of our days as well as the occasion and circumstances of our death. Death is by God’s sovereign decree and will not come a moment before His predetermined will. Why did Faithful have to die, but Christian escaped? How could God permit such agony for one while sparing the other? This is a great mystery, but we can trust that God, “who did not spare His own Son, but delivered Him up for us all” (Romans 8:32), is working for the good of both in a way that will bring Him the greatest glory. The Lord holds the king’s heart in His hand (Proverbs 21:1)—and even the hearts of a cruel judge and jury. One pilgrim is delivered to death, faithful to the end, as a testimony of the supreme value of life in Christ. The other is released to press on in the faith as an encouragement and hope for others. And God, who “overrules all things” is glorified by both.